Welcome to Joe’s online store! Feel free to contact us if you have any questions about a product. All products in the store are available signed personally by Joe. For the entire catalog of Wizdom Media products, please visit www.wizdom-media.com. Check out the new lower prices on many items in the store! The ultimate drummer's and fan's retrospective on the career of the legendary Neil Peart. Neil not only wrote the foreword for the book, but also supervised the project and provided additional factual editing. This book is the most complete retrospective on Neil’s career available in print today. Originally conceived as a companion to the groundbreaking 2011 three-disc DVD set of the same name, this book combines astonishingly detailed musical transcriptions, historical writing, instructional text, and a beautiful collection of photographs to create a book that every drummer and every fan of Neil and Rush will want to add to their collection. IN STOCK NOW! 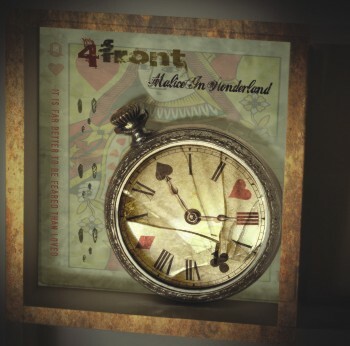 New album from 4Front, featuring 10 new instrumental progressive songs in the style of Rush, Kansas, Dream Theater, etc. Zak Rizvi: guitars & keyboards, Joe Bergamini: drums, Frank LaPlaca: bass, with guests David Rosenthal (keyboards), Carmine Giglio (keyboards), and David Richards (sax), and art design by Hugh Syme. 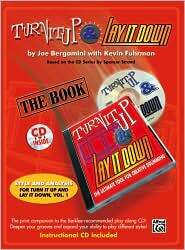 Drummers and teachers worldwide have been praising and working with the Turn It Up & Lay It Down series of play-along bass CDs produced by Spencer Strand. Now, the definitive educational companion has arrived, a method book that offers you a plethora of groove options to perform with each track in all of the various styles from the CD. Plus, you'll see how to use Turn It Up & Lay It Down in conjunction with dozens of drum books with a one-of-a-kind cross-reference section in each chapter. Also included throughout the book are sidebars that highlight the inspirations for these grooves, such as Steve Gadd, Bernard Purdie, and Jeff Porcaro. In addition, 10 of the best-known drum educators have ended their unique grooves written specifically for this book. Turn It Up & Lay It Down—“The Book”— is an indispensable educational resource unlike any other drum book. The Evolution of Jazz Drumming presents a complete historical overview and analysis of jazz drumming. Designed as a guide and workbook for the high school, college level, and professional drummer, it is designed to be studied based on a typical 16-week college semester. A legendary and influential jazz drummer is studied during each of these weeks. Upon completion of the book, the user will have a complete understanding of the influential contributions of these jazz masters, which is necessary for any musician to play this music authentically. The 31 jazz drumming legends included are examined with musical analysis including practice exercises in the style of the subject’s drumming, transcriptions of both solo and time playing, and études that examine the work of each artist in unprecedented detail. Each profile also includes a complete biography, personal anecdotes from the author, and dozens of exclusive and rare photos, many of which have never appeared in print before. The book includes a DVD of classic video clips of many of the drummers, as well as an MP3 disc with over 300 tracks. Video clips on the DVD are analyzed and transcribed in the text, while the MP3s consist of exercises and études from the book recorded at various speeds, that can be looped for analysis and practice. 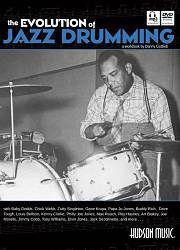 Drummers featured in the book include Baby Dodds, Zutty Singleton, Sonny Greer, Chick Webb, Gene Krupa, Papa Jo Jones, Buddy Rich, Dave Tough, Louis Bellson, Kenny Clarke, Shelly Manne, Max roach, Roy Haynes, Art Blakey, Mel Lewis, Joe Morello, Sonny Payne, Sam Woodyard, Jimmy Cobb, Tony Williams, Elvin Jones, Jack DeJohnette, and many others. A complete handbook on drum technique, including full illustrated descriptions of the Moeller Technique, the Free Stroke, and other important drum techniques. Also includes Dom's customized drumset lessons focusing on various skills including flams, ruffs, groove creativity, odd time signatures, and much more. 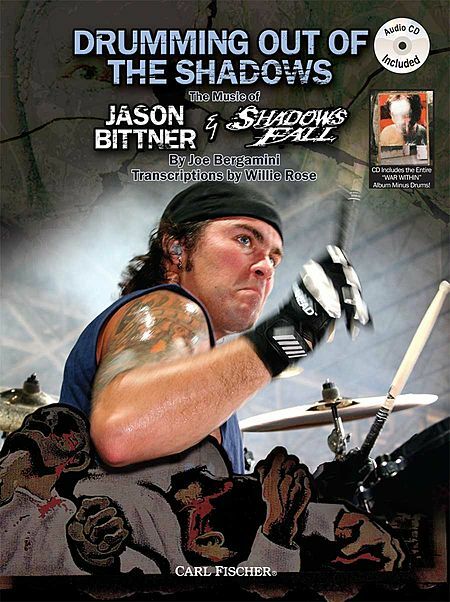 A newer entry in Joe’s series of transcription/collectible books, this book features note-for-note transcriptions of 17 Shadows Fall songs, notes from Jason discussing his memories of recording each album, Jason's personal double bass drum exercises, exclusive interviews, and tons of exclusive photos and artwork. At 122 pages, the book is designed for the general fan as much as the drummer. One of the most exciting things about the book is that it contains the entire Shadows Fall album The War Within, for which Jason won the Best Recorded Performance award in Modern Drummer Magazine for 2005. This exclusive CD contains the entire album with the drums taken off, so you can have the experience of filling the shoes of award-winning drummer Jason Bittner. With both educational material and note-for-note transcriptions, this unique book reveals the polyrhythmic concepts employed by one of today's hottest players. The first half of the book contains step-by-step analysis of various polyrhythms and their applications, while the second half contains transcriptions of select tracks from the Dillinger Escape Plan album Miss Machine, showing the ideas in action. The CD includes MP3 audio files of tracks minus drums and drums-only examples, plus Reason files that can be sped up and slowed down on your computer as you learn them! Topics include: sticking polyrhythms, rhythmic scales, rudiment grooves, double bass paradiddle grooves, ostinato polyrhythms, and more. Transcriptions/collectible book written under the supervision of Scott Rockenfield. 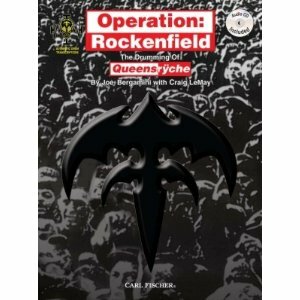 Contains interviews, photos, band history, and note-for-note transcriptions of 20 Queensryche tracks. All of the additional material, such as the 3 new interviews with Scott, diagrams and photos of all of his drum kits through the years, and personal recollections from Scott on the making of each album, make this book a must for Queensryche fans in general, and not just drummers. Included is a CD on which Scott has re-recorded the drum parts for the songs by themselves, for analyzation with the charts. Inclued are the following songs: Anarchy-X, Best I Can, Breakdown, Disconnected, Empire, Eyes of a Stranger, I Don't Believe in Love, Jet City Woman, The Lady Wore Black, Operation: Mindcrime, Queen of the Reich, Revolution Calling, Spreading the Disease, Silent Lucidity, Sign of the Times, Take Hold of the Flame, Tribe, Warning, Walk in the Shadows and The Whisper. 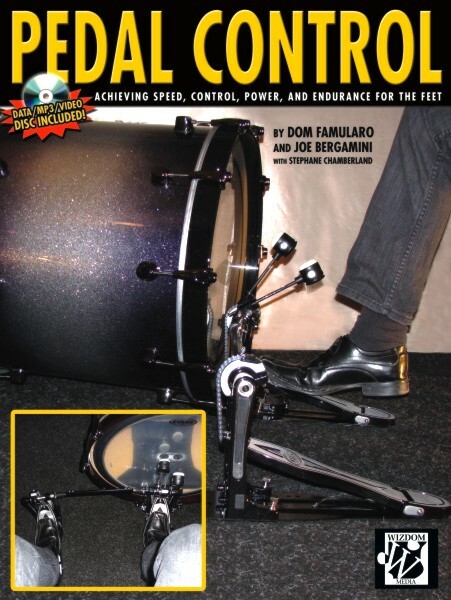 With Pedal Control, renowned educators Dom Famularo and Joe Bergamini have teamed up to bring you a complete method for improving the ability of your feet on the drumset. 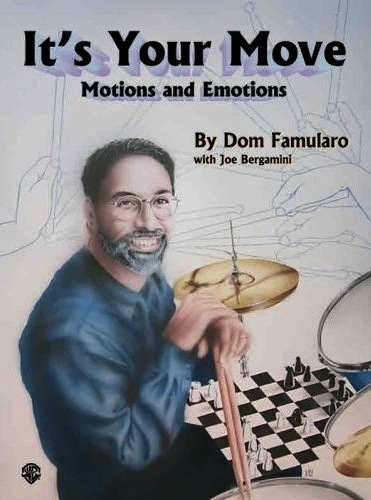 Unlike many other books, Pedal Control contains extensive information about the actual pedal strokes and techniques used by some of the world's top drummers, in addition to dozens of exercises to build up the ability to use these techniques. This book is about a deeper understanding of foot movement on the drumset. Years of learning, performing and teaching have been the basis of this information. The power of great foot execution adds an intensity to modern music that has revolutionized modern drumming. Simply put, Pedal Control is about controlling your pedals: whether two bass drums, double pedal, single pedal and hi-hat, or any other configuration. It is about you achieving the ability to play whatever idea your heart and mind dictate, on whatever setup you choose! Part 1 of this book focuses on a complete explanation of 4 contemporary pedal techniques, while in part 2, exercises from Dom's best-selling book It’s Your Move have been adapted for foot development, accompanied by tons of new material and challenging solos to build up your foot technique. There are plenty of photographs throughout the book clearly demonstrating each of the four different pedal techniques discussed, as well as the motions for various other exercises. 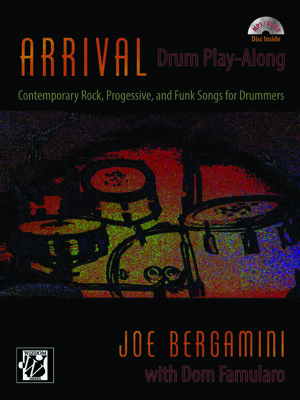 Includes an MP3/data disc containing over 200 MP3 tracks demonstrating nearly every example in the book, and 7 QuickTime videos clearly showing the pedal techniques. 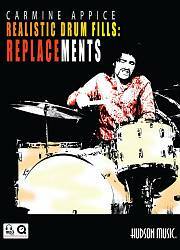 In this book, rock drum legend Carmine Appice shows you how to play exciting drum fills like the pros, using a systematic method of replacing certain notes in the 16th or triplet flow with bass drum strokes. By using this book you can learn how to incorporate your bass drum into your fills, creating a complete vocabulary of cool ideas to use in your playing. Using the same award-winning approach as Realistic Rock, the patterns contained in the book start with 8th notes and progress to 16th notes and triplets, with the rhythms split between the hands and feet. The fills are then expanded to include mixed stickings and accents, and are orchestrated around the kit. 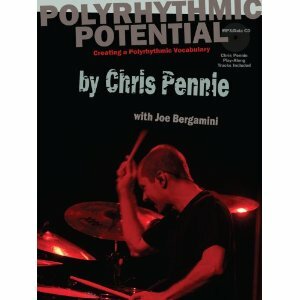 The included MP3 disc contains audio examples of many of the patterns in the book, as well as video footage of Carmine in live performance, showing how he applies these concepts. Realistic Drum Fills will give you the ability to play tons of cool drum fills that rock! Designed as a reference tool for the contemporary player, MD Classic Tracks contains note-for-note transcriptions of legendary tracks performed by 13 of the most important drumset artists of our time. These charts have been selected because they represent these legendary players and because these songs have never appeared in a complete, published transcription before. 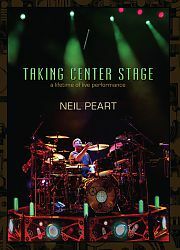 On this 3-disc DVD set, Neil Peart examines the challenges of live performance. 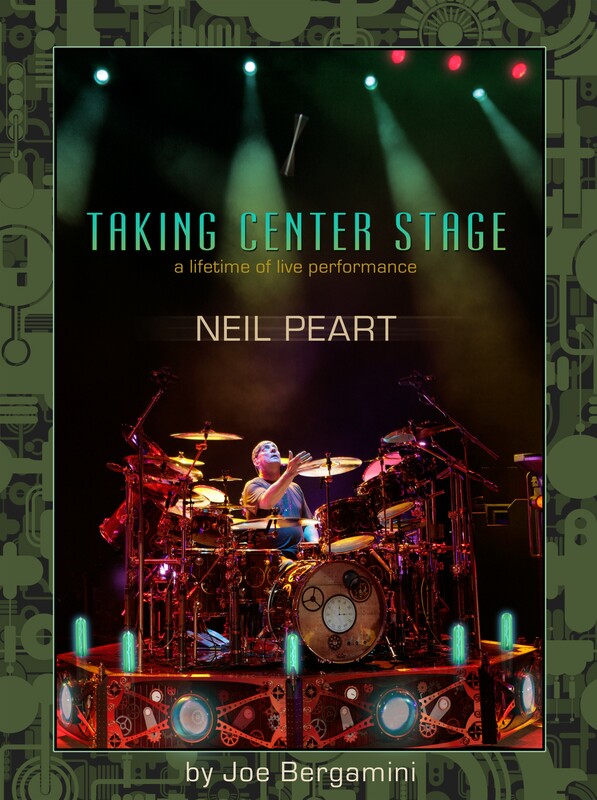 Drawing from over 30 years touring the world, Neil breaks down, demonstrates, and performs classic drum parts from songs spanning the entire Rush catalog, thereby giving the viewer the most in-depth insight into Neil’s body of work ever documented. Filmed in various locations over the course of a year, Neil takes you on a behind-the-scenes look at Rush’s 2010-11 Time Machine Tour. Beginning with a visit to his personal pre-tour rehearsals, Neil shows the ways in which he prepares for the upcoming tour. The viewer is then transported backstage at a Rush concert to witness the setting up of the drumset, the soundcheck, and an unprecedented backstage interview where Neil explains and runs through his warm-up routine, and discusses the upcoming concert. Neil then presents a detailed look at every single song in the Time Machine set list (which includes the entire Moving Pictures album). For each song, key grooves and fills are analyzed by Neil in an interview setting with Hudson’s Joe Bergamini. For each groove and fill discussed, both full-speed and slow-motion drums-only demonstrations are included, coupled with PDF icons that allow the viewer to analyze and practice the patterns using the included PDF eBook. At the end of each song discussion, the viewer is transported onstage to a Rush concert to see the actual live performance of the song from the perspective of the drum cameras only (with an exclusive, custom audio mix that features the drums heard slightly louder than a normal concert DVD mix). Bonus features include two additional live performances (seen from the drum cameras only) from the 2008 Snakes and Arrows Tour, an additional educational segment on the song “Bravado,” PDF eBook, photo gallery, and an interview with Neil’s drum tech Lorne Wheaton. 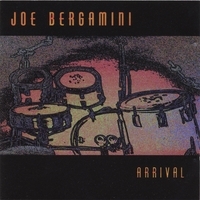 1996 solo release from Joe, featuring 4Front bandmates Zak Rizvi (guitar) and Frank LaPlaca (bass). Co-produced by Dom Famularo. Contains 10 tracks in various rock styles, including a drum solo. 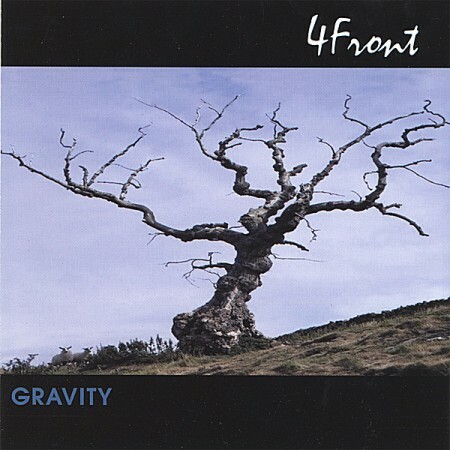 2002 prog-rock release featuring Zak Rizvi: guitars and keyboards, Frank LaPlaca: bass, and Joe Bergamini: drums. 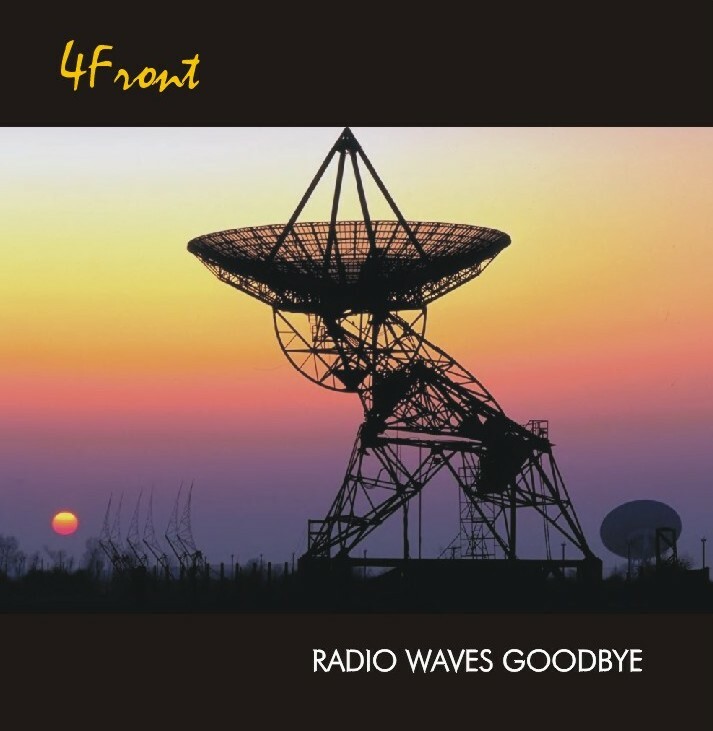 12 tracks, all instrumental with the exception of a cover version of David Bowie's “Space Oddity.” Guests include Jimmy Wilgus (keyboards), Karl Kessler (violin), Tom Mulvaney (percussion), and Bob Magnuson (saxophone). 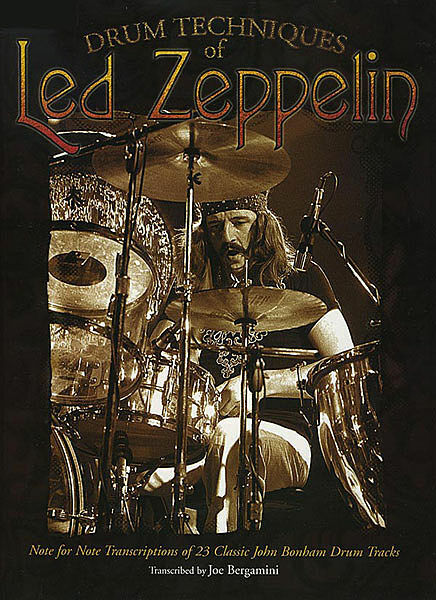 Joe’s best-selling book, featuring note-for-note transcriptions of 23 legendary John Bonham/Led Zeppelin drum tracks, including “Black Dog,” “Fool in the Rain,” “Stairway to Heaven,” “Whole Lotta Love,” “The Ocean,” “Nobody's Fault but Mine,” “Dazed and Confused,” “Over the Hills and Far Away,” and many more. Easily one of the most detailed and accurate documents of Bonzo’s playing available today.